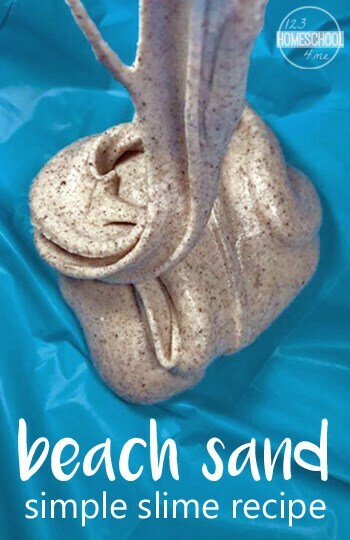 Bring some beach fun home with this super simple beach sand slime recipe kids of all ages will LOVE! My family and I recently took a vacation to California. The purpose of the trip was Disneyland, but we first had to make a pit stop at the beach. Growing up near the Pacific Ocean then being transplanted to the Midwest, it was important to me for my daughter to experience the real ocean. I wanted her to have all of the cliche beach moments: sand between her toes, waves crashing at her feet and the sun warming her face. That is exactly what we did, only for a few hours though. Then beach time was over, but I grabbed a bag of sand to take home with us. My original idea was to use it for mementos of our trip, which we did, but we had extra. I never would have guessed, when collecting that beach sand, that we would be using it for a Beach Sand Slime Recipe, but we did and it is amazing! We have made many slime recipes before but never with contact solution. Have you used it? 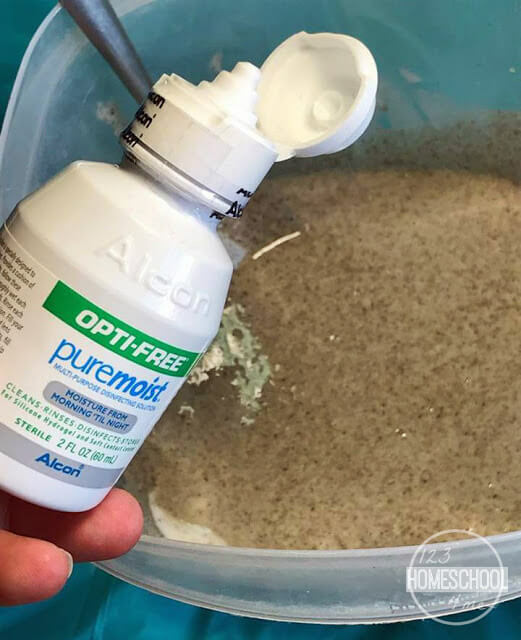 The recipes that call for borax are easy to do, but using contact solution is my new favorite way! It’s simple, inexpensive and the texture of the slime turned out perfect! We started off by sifting the sand. Sand contains glass and little pebbles, which is fine, but I wasn’t looking for a chunky textured slime. I wanted to remove anything that would compromise a super soft, stretchy slime consistency. 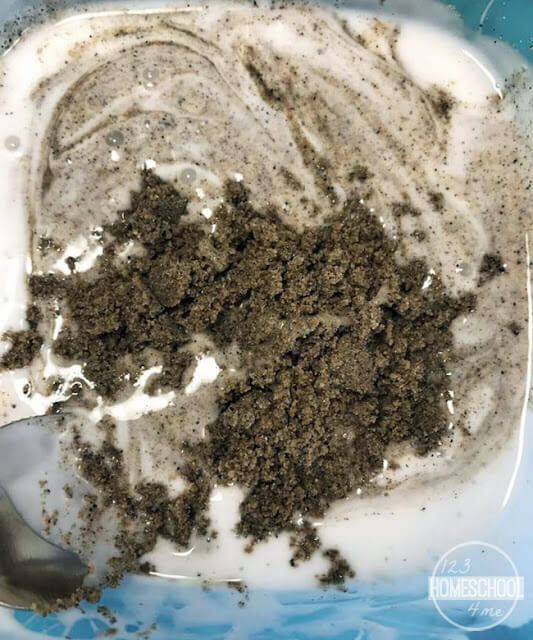 When the sand was sifted, we poured a 4 oz bottle of white glue into a bowl. Next we added baking soda and stirred. After stirring, we added about 1/2 cup of the sifted sand. I did it in smaller increments, stirring in between. I wanted to make sure that the sand was mixed in completely. I didn’t want my daughter to play with the slime and then have residual sand on her hands. (Not that it would have hurt anything, just not what I was going for). My daughter stirred while I added the sand and we made sure it was mixed in completely before moving on. The next step is the end all. If you don’t have all of your sand mixed in, it probably won’t if you move onto the next step. Make sure you are ready for slime before taking the next step. Start squirting in contact solution, then stir. We repeated this process until the slime was 100% slime. I gave it a quick, extra stir and plopped it on the table. I’m not sure how much contact solution we used, but as you can see it was a small bottle and we didn’t use anywhere near all of it. We just used as much as it took to make the slime the perfect consistency. This slime is stretchy. It doesn’t break apart when you try to pull it. This slime is textured. 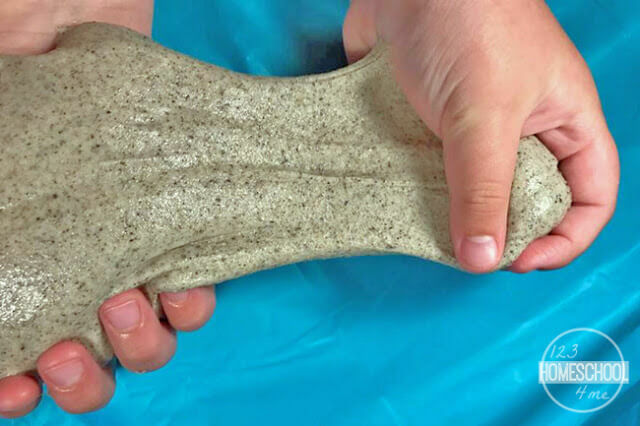 Although the sand doesn’t get onto your hands when playing with the slime, you can still feel the texture of the sand in the slime. It is the coolest thing! This slime was super easy to make. I think from start to finish we probably had slime within 5 minutes or less. It was unbelievably simple and clean up was almost nothing. We are storing this slime in a air tight, ziplock bag. So far it has maintained its texture and consistency after being stored. 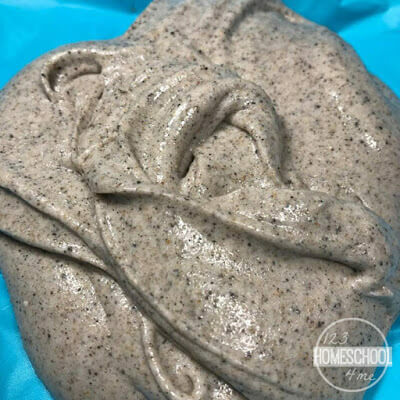 I’m not exactly sure how long it will last, but I am so glad we took the chance to use some of our beach sand in this slime recipe. It turned out perfect!